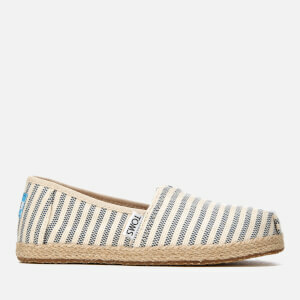 Kids’ iconic ‘Alpargata’ espadrilles from L.A. footwear label, TOMS. A member of the One for One® family, TOMS match every pair purchased with a pair of shoes for disadvantaged children. Part of the Youth Classics collection, the pumps are crafted with white and blue, striped canvas uppers and a signature rope wrapped midsole. The slip-on shoes comprise a rounded toe with TOMS signature toe-stitch and an elasticated ‘V’ panel for easy on and off. The vegan pumps sit on a rubber outsole for durability and traction. 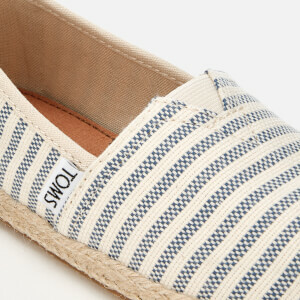 Complete with the signature woven TOMS label stitched to the vamp and signature branding on the heel.